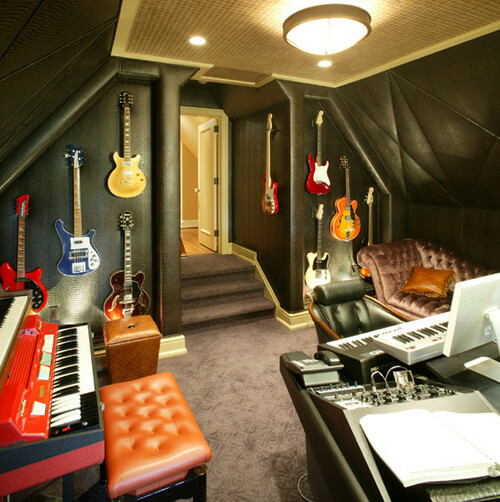 How would you feel if you have this kind of music room in your house? Great, isn't it? This place is perfect for music lovers! The sound proof wall makes it an ideal place for voice recording and those leather sofas are pretty awesome! The guitar collection with those vibrant color are simply amazing! Building a music room, I guess is not that easy. It entails a big capital and of course, a great passion for music. My daughter once dreamed of having a fender fa 100 acoustic guitar from guitar center but that remains a dream as she already dropped her passion for music for a while. She is now prioritizing her studies and I couldn't agree more. I am thinking that she could always get back to her passion at a right time anyway. To have this kind of music room is certainly a good idea. Why not? If you have enough money for the musical instruments and an exceptional talent in home decorating plus a burning passion for music, this dream would come into a reality. But since, we are not really musically inclined, I guess this will be the least of our priorities for now. I really love the design though and I salute the designers who came up with this brilliant design.